Holland is very well-known for its female-fronted bands like Within Temptation, After Forever, Epica and indeed Autumn. This band released their first record 'When Lust Evokes the Curse' in 2002 and the new album 'Altitude' is their fourth one. With ups, but also many downs they proved to be a consistent and lasting band. The biggest down was the departure of former singer Nienke de Jong. They had just released their third album for their new label Metal Blade Records when she had to leave the band due to health problems. It was a hard decision for Nienke to leave the band she had always put all her energy and sweat into. With no hard feelings on both sides, the band had to look for a new singer. They werent' on the lookout for a woman in the first place, but it turned out that the best audition was done by Marjan Welman. Some of you might know her singing the song "E=MC2" on Ayreon's '01011001' album, she had her own band called Elister as well. 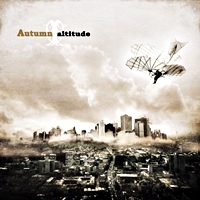 On their new album Autumn has distanced themselves even further from the Gothic influences; the band has created their own recognizable sound: it is a kind of heavy symphonic rock sound. Every single track is a well arranged, very mature and a perfectly balanced song. Musically they find their ideas in many different styles of music: Progressive elements, 70's rock (Uriah Heep/Deep Purple), metal and so on. The warm, tight and atmospheric production makes this a rock-album that is second to none. Marjan's voice has a warm and bright sound; she fits perfectly in the rock songs like opener "Paradise Nox", "The Heart Demands", "Horizon Line" and the heavy grooving riff monster: "Sulphur Rodents". In the softer and easier songs her serene vocals are first class. As already said before, the band mixes a lot of different styles in their music, in several songs they add Hammond organs to them and that gives it a retro feeling. The name The Smashing Pumpkins crosses my mind listening to the song "A Minor Dance" and in the beginning of "Cascade". Worldly music from a band with a big future. Don't hesitate any longer and listen to it yourself; there is a full album stream on their Myspace site. The LTD 1st Edition includes 2 bonus tracks.